At the end of the month, we’ll be leaving winter – and all the chills, heaters and super thick jackets – behind. Not only does this mean we will be in store for a new wardrobe, but it means that it’s time to truly leave winter in the past and start spring cleaning. That’s right – it’s time to drag everything out from under your bed, grab out all your clothes from your cupboard, and to tip out those drawers that you just shove anything and everything into. It’s time to really start cleaning. You may have heard about Marie Kondo and The Life-Changing Magic of Tidying Up. Kondo is a Japanese organizing consultant and she can change your life. I tend to find myself being messy, and just leaving things around without putting them away. I’d keep saying “no, I’ll do it later.” I would just clean a small part of the house and intend to do the rest another time. Kondo recommends setting aside a day or afternoon and just getting it all done at once. She also suggests sorting out using categories rather than location. Start with clothes, then books, then papers, then miscellaneous and sentimental items. Go through the whole house and clean out the categories one by one. 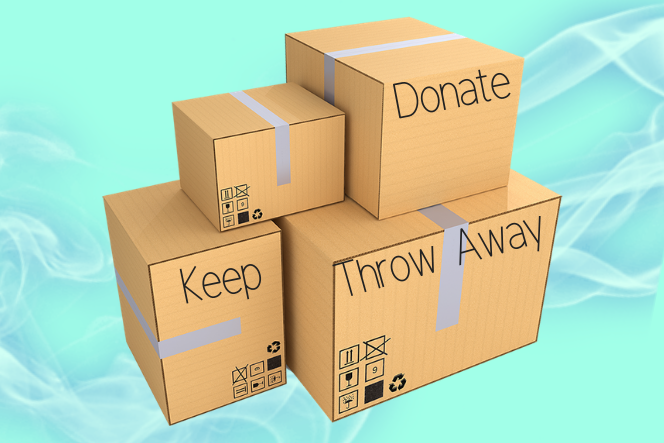 Don’t just put things in storage, but discard them. I know, it can be hard to tear yourself away from things, but here’s what was most helpful to me: Kondo says that when looking at an item, you should ask yourself “does this spark joy?” If it does, then keep it, and if it doesn’t, then thank it for all it has done and discard of it appropriately. To keep your home life clean, when purchasing things or bringing new things into the house, make sure it’s something that brings you joy or something you really need. Do you really need that black shirt when you already have two that are similar? And if the others need replacing, why not throw them out? Don’t clutter your life unnecessarily. Once your surroundings are tidy and you’ve cleared your space of anything negative, you need to look within yourself. We often get so caught up in the comfort of life that we forget to look after ourselves. Sometimes we surround ourselves with people who we don’t particularly want to be around. Throughout high school, I found myself around people who put me down and made me feel low. How those people made me feel really had a negative impact on my life. I could see my grades dropping, I could feel myself gaining weight, and I generally just felt unhappy. There came a point where I had to evaluate my situation – those people around me didn’t make me happy, so why was I subjecting myself to that torture every day? I know I wasn’t the only one to feel that way, and I’m so proud of all of those people breaking out of their toxic friendships. Just like our bedrooms, our personal lives can become cluttered with junk too. Don’t be afraid to clear certain people out – don’t live off the nostalgia that those people bring. Look into the future, and make decisions now to ensure your own happiness. There are great people who love you, and those are the people who you need to surround yourself with: the people that care about you, and the people that bring you joy. Of course, there are other things that can clutter your mind too. Worries can be about work, family, friends, the future and the past. It’s okay, and it’s natural, but sometimes it can be a lot to handle. Grab a piece of paper and a pen (and get a good friend or family member too, if you need). Start a list – write down every single thing you’re worried about. If you want, you’ll be the only one to see this so there’s no point in hiding from yourself. Once you’ve finished writing out your worries, look at them one by one and think about how to improve each situation. You’re stressed about uni? You might want to look into dropping a class, asking for extra help or rethinking your schedule. Cross each problem off one by one, until you feel even a little bit better. However, don’t be afraid to seek help from friends or trained professionals. There are support systems out there if you need them. When life gets too busy, it can be easy to forget to look after your physical self too. Once a week, throw your bed spread in the wash, and let it dry in the sun. Meanwhile, have a bath or shower – a long one. Let the hot water run over you, washing the week away. Wash yourself properly. Use that fancy shampoo or bath bomb that you’ve been saving (or steal your girlfriend’s cool shower products). Then, sit outside for a while and drink some water. Cleaning up isn’t just about dusting your room every now and again. It’s also about making sure everything is in order, and that you’re only keeping the good things in your life.